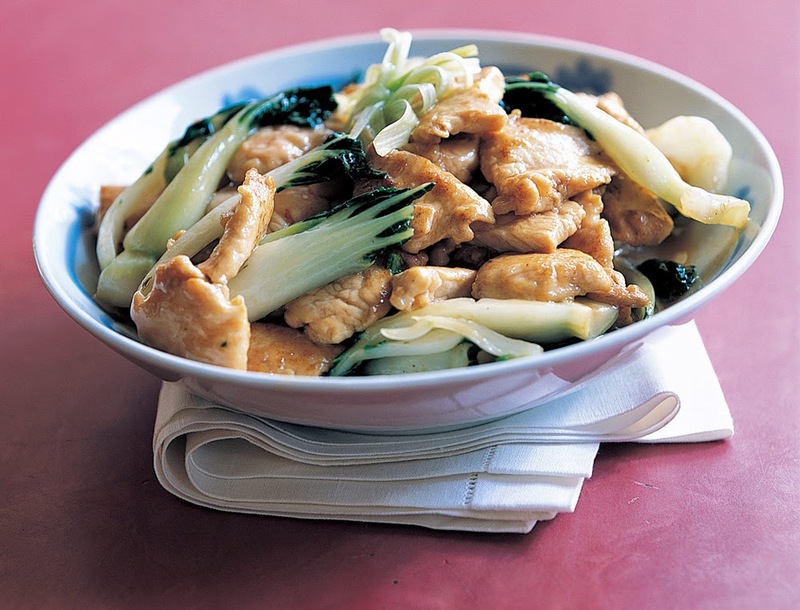 Traditional Cantonese cooks, insists on adding a little chicken skin to stir-fry to enrich the taste. They blanches the choy sum in chicken broth to flavor the vegetables. If you don't have black soy sauce, regular soy sauce can be used, but the taste is not as robust. 1. Remove the skin from the chicken and set aside a 2-inch-square piece. Cut the chicken into ¼-inch-thick bite-sized slices. In a bowl combine the chicken, rice wine, 2 teaspoons of the cornstarch, the 2 teaspoons oil, the soy sauce, 1 teaspoon of the black soy sauce, and the egg white. Marinate uncovered in the refrigerator 1½ hours. Remove from the refrigerator and set at room temperature 30 minutes. 2. Trim the tops and stems of the choy sum by ¼ inch. Bring ½ cup of the broth to a boil over high heat in a medium saucepan with 3 slices of the ginger and 1 garlic clove. Add the choy sum, cover, reduce the heat to medium, and blanch 1 minute. 3. Drain the choy sum in a colander and discard the broth, ginger, and garlic. In a small bowl combine the oyster sauce, salt, and the remaining ½ cup broth, ¾ teaspoon cornstarch, and ½ teaspoon black soy sauce. 4. Heat a flat-bottomed wok over high heat until a bead of water vaporizes within 1 to 2 seconds of contact. Swirl in 1 tablespoon of the oil and the remaining 4 slices ginger and 3 garlic cloves. Carefully add the chicken, spreading it evenly in the wok. Cook undisturbed 1 minute, letting the chicken begin to brown. Then, using a metal spatula, stir-fry 2 to 3 minutes or until the chicken is lightly browned on all sides and is just cooked through. Transfer to a platter. Rinse the wok and dry it thoroughly. 5. Swirl the remaining I tablespoon oil into the wok. Add the reserved chicken skin and stir-fry 30 seconds. Add the blanched choy sum and stir-fry 10 seconds. Stir the oyster sauce mixture, swirl it into the wok, and bring to a boil, stirring constantly, until the sauce has thickened, about 1 minute. 6. Spoon the vegetables and sauce over the chicken, discarding the browned chicken skin.